I am a British writer, living in Kent, England. Hazard is Book 5 of the Rockliffe series . Aristide and Madeleine Delacroix have been part of the extended cast since Book 3, The Player. I gradually became fascinated with Aristide and wanted to know him better. Madeleine and Nicholas's relationship began in The Player, nearly came to grief in The Wicked Cousin and therefore needed to be resolved. Look out for Rockliffe Book 6 - Cadenza - coming soon. Aristide Delacroix is a puzzle of a character. Owner of a respectable gaming club, he is also in love with Genevieve. But his past catches up with him when he is accused of cheating at cards years back in Paris. The aristocratic Duke of Rockliffe and some of his closest friends stand by him, endorsing his business and conveying the message that a man proves himself by his integrity and not hearsay. The narrative also features a journey of love between Aristide’s sister, Madeleine, and a persistent suitor, Nicholas. It is the colorful 18th century, London, and the author does an impeccable job in using the social and historical elements of the setting to enrich the story. 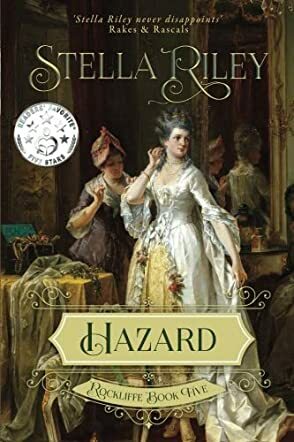 Hazard is the fifth book in the Rockliffe series by Stella Riley and it is a compelling historical romance, filled with drama and intrigue, and featuring conflicts that involve characters emotionally, psychologically, and even physically. This is a novel with a complex plot and characters that readers will enjoy. It is recommended to start this series from the first book, especially if one wants to fully enjoy the characters and follow their romantic journey and the intrigues that make the story gripping. However, I enjoyed this story as a standalone as well. One can’t ignore Stella Riley’s gift for prose and her ability to hold the reader’s attention. Her use of suspense is impeccable and it happens mostly with the shift between subplots and points of view. While I was fascinated by the evolving romance between Aristide and Genevieve, I couldn’t help wanting to know what would happen to Madeleine. The drama is intense, the characters real and likeable, and the plot filled with emotionally charged moments. Hazard has a sophisticated plot structure, but what caught and sustained my attention is the author’s craft — the crisp and enjoyable writing and the powerful narrative tone. If you are a fan of historical romance, then you won’t want to miss this. It will keep you awake all night long, and you’ll want more. I Completely agree with your excellent review. I’m a big fan of Stella Riley ‘s work.